Steve Jones began working at Universal Protection Service in 1996, when it reported about $12 million in annual sales. He has since built the Santa Ana-based firm, now called Allied Universal, into the largest US security firm, with a workforce of 210,000 and an estimated $7 billion in sales this year. 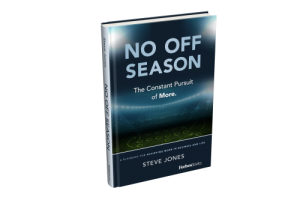 The following is an excerpt about Jones’s first day on the job at Universal Protection Service, taken from his recently published book, No Off Season: The Constant Pursuit of More. We arrived at a restaurant and met the folks from an Orange County-based real estate company that at the time was Universal’s biggest and most important client. Not even halfway through my very first day and my company’s very biggest client had decided to give us our walking papers. No one knew what to do — including Brian. The silence and the awkwardness were excruciating. In the midst of it all, I realized that if someone were going to fix things, it would have to be me. Even at that point, I had been in business long enough to know there were a number of ways that people in my position might react to such a situation. I didn’t make any of those plays. I certainly wasn’t simply going to accept the fact that the most important client to the company I had just joined was going to walk out on our lunch and take their business with them. But I wasn’t going to plead. Pleading never works, not really. I certainly wasn’t going to get angry. Anger never works, either. The property manager was so impressed by my direct, no-nonsense handling of a situation that might have triggered panic in some other young executive that she gave me those 30 days I’d asked for. I took full advantage of the opportunity. The first thing I did was ask the representatives to let me know everything that had left them dissatisfied with the services we provided to them. It was a long conversation. Then, I went and fixed those issues. At the end of 30 days, the real estate company agreed to continue the contract. In fact, it is still a customer today. That wasn’t the end of it. If our largest and most important client had issues, then I was certain all of our clients had problems with us. Day after day, I reached out to every one of our customers and set up meeting after meeting, talking to every client until I was certain I knew what problems existed with every contract. Then, I took all of the comments I had acquired and set out a plan of action to address them all. I went through the list methodically, and I didn’t stop until I had taken all of the steps necessary to correct each and every problem. The information every business really needs lies within the complaints its customers make. As CEO, Steve Jones presides over all Allied Universal companies and their respective divisions.